Video clip synopsis – The opening sequence from Six O'Clock Rock - Australia's first national teenage programme on the ABC. Scott Goodings gives a history of music shows on Australian television. Broadband MP4 poprock_bb.mp4 (10.0MB), suitable for iPods and computer downloads. This video clip is the opening sequence from popular ABC teenage programme from the 1960s Six O’Clock Rock, produced by the Australian Broadcasting Commission. 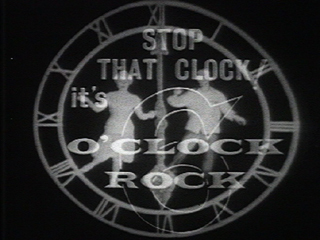 Six O’Clock Rock is made available by ABC Content Sales and is on the From Wireless to Web website, produced in 2005. This interview with Scott Goodings was recorded for the website. Scott Goodings is a self-proclaimed “TV freak” and walking archive. You can view his full biography at From Wireless to Web. create a poster display of the biography of a well-known Australian involved in the development of TV pop and rock music. The invitation to join Australia’s first 'live’ rock’n'roll show was broadcast on the ABC at 6pm on Saturday 28 February 1959. With that, rock’n'roll converged upon Australian television and captured a whole generation. Social conservatives feared that rock’n'roll could ruin the fibre of the nation. The ABC’s weekly Six O’Clock Rock was hosted by the legendary 'wild one’ Johnny O’Keefe, King of Australian rock’n'roll. Dame Enid Lyons raised the matter in Federal Parliament. This only served to boost the ratings, and 6000 teens queued for tickets to be part of the live studio audience. Nine months down the track, Brian Henderson’s Bandstand on TCN9 took the threat out of rock’n'roll by transforming it into something for the whole family. Neater, more clean-cut and altogether nicer, Bandstand ran for 14 years, and launched the careers of many Australian musicians. The plug was pulled on Six O’Clock Rock in 1962 when O’Keefe moved to ATN7 to host The Johnny O’Keefe Show. The ABC followed with Hit Scene and GTK, before launching Countdown in November 1974. The iconic live music show went to air every Sunday night until 1987, hosted by Countdown frontman Ian 'Molly’ Meldrum and a parade of celebrity guest hosts. Appearances on Countdown were pivotal for national and international acts. Explain what Scott Goodings means when he refers to the TV program Countdown as ‘egalitarian’. In Goodings’ opinion, why is TV program Australian Idol important? From the written information presented on-screen in the clip from Six O’Clock Rock, what does this TV program claim itself to be? Who is the singer featured on the clip’s soundtrack? the link between camera ‘cuts’ (or editing) and the music. View one of the latest TV rock music programs then write, edit and proofread a review of it in 300 words for a magazine aimed at the 11–14 age group.